Welcome to Michigan By The Bottle! 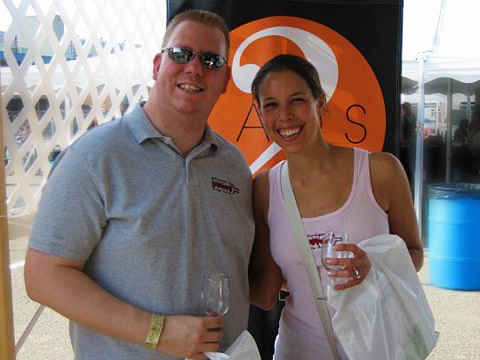 We are Shannon and Cortney Casey, certified sommeliers and suburban Detroiters who adore Michigan wine. We firmly believe the wines from our great state, and the wineries that produce them, are generally under-appreciated and under-publicized. We're convinced that there's an entire population of prospective Michigan wine lovers that remains untapped. We've also learned since starting MBTB in 2009 that there's an extensive fan base of consumers enthusiastic about "drinking local" that was ripe for unification. Providing original content on Michigan wines and wineries, including articles, video features, video podcasts, travel diaries, photos and more. Compiling links to Michigan wineries' websites and social media accounts to allow easy access. Aggregating links to content on Michigan wines from across the web. Promoting events involving Michigan wines and wineries. 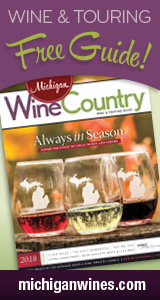 Guiding visitors, via the site and our iPhone/iPad app, through Michigan wine country. Introducing readers to new wines or helping them rediscover old favorites through Tweet & Taste Michigan (virtual events that highlight specific wineries and allow Twitter users to interface with the winemakers). Encouraging interaction between Michigan wine fans through Facebook and Twitter. MBTB also aims to dispel misconceptions seemingly rampant among the 20- and 30-something set that wine is appealing only to older demographics, as well as assure newbies that Michigan's tasting rooms are places ripe for learning and exploring, not daunting havens for elitist wine snobs. Wine is fun! Interested in advertising along the right-hand side of our website? We have one-month, three-month and full-year packages available. It's the perfect way to get the word out about your wine-related business, from individual wineries and entire wine trails to amenities in wine country, like restaurants, lodging facilities and transportation services. For more information, please email wine@michiganbythebottle.com. In April 2011, we also launched a side venture, MBTB Media, that provides social media presence management for client wineries. For more information, please email wine@michiganbythebottle.com. Please note that advertisers do not receive preferential treatment in terms of coverage on MBTB. We appreciate our sponsors immensely, but we continue to cover and promote wineries' events and products regardless of whether they buy an ad or not. We remain whole-heartedly committed to our mission to tout the Michigan wine industry universally. In the course of collecting fodder for the site, we are occasionally offered free wine, food, lodging, etc. We appreciate and often accept many of these opportunities, because as much as we would love for MBTB to be our day job, it's not. Therefore, it can become quite costly to visit as many locations and try as many things as we do to generate the quality and quantity of content we feel is needed for the site to thrive. The Federal Trade Commission requires that we disclose whether we receive a wine sample for free; we typically do so via a statement at the end of any podcasts, etc. We still buy the vast majority of Michigan wines that we consume. Regardless of whether we receive something free, discounted or at full price, all impressions shared on MBTB are 100 percent genuine. We never tout anything we don't like. Because the overall tone of MBTB is intended to be positive, we generally phrase it gently or avoid harping on it if we aren't enamored with something. We want Michigan wine fans to trust that they can count on us for sincere opinions, free of undue influence. We have, and always will, operate in this manner. Besides, everyone has their own opinions – and we want to hear YOURS! Wine samples are accepted and welcome for possible inclusion on podcasts, but please note that sending a sample does not automatically guarantee that a wine will be featured on the site.